Cast adrift in a post-Soviet world, Cuba has radically realigned its economic relations from the former Soviet bloc to the capitalist market economies. Following the collapse of the USSR in 1991, the island nation’s GNP declined by an estimated 35 percent in 1993 compared to 1989. Responding to the acute economic crisis, the Cuban regime has been obliged to open up the country to foreign investment and tourism, dollarize the economy, and permit limited self-employment by Cubans in crafts and services. A central goal of the regime has been to maintain intact the Marxist-Leninist system, including the socialistcommand economy. Notwithstanding President Fidel Castro’s aversion to market reforms, his government has made tactical concessions that can be withdrawn or modified, as has happened with selfemployment since 1996. Since the end of the Cold War the United States has continued its policy of economic denial—the comprehensive embargo of Cuba has been maintained and strengthened. By contrast, Canada under Prime Minister Jean Chrêtien (1993–2003) initiated a strategy of “constructive engagement” and dialogue with the Cuban government that included a broad range of commercial transactions. Under Chrêtien, Canadian policy operated on the premise that promotion of dialogue and comprehensive business relations with the regime gradually would bring about political and economic liberalization in Cuba. Canada’s economic interactions with Cuba offer a mirror image (and some predictive value) of U.S.- Cuban business relations in a post-embargo future. Although much smaller in magnitude than the United States, Canada is also a prosperous market economy with a similar, diversified sectoral structure (heavy and light manufacturing, temperate-zone agriculture, mining and metallurgy, and technically-sophisticated services) and its eastern provinces are geographically located quite near the largest Caribbean island. This paper has two objectives. First, it will review Canada’s economic relations with Cuba since Fidel Castro enacted in 1990 a “Special Period in Time of Peace.” Significantly, the “terms of engagement” under which foreign companies participate in Cuba differ greatly from those that apply in other Latin American countries. Because Canadian officials and business enterprises have accepted these unique operating rules, how have Canadian investments benefited the regime vs. ordinary Cubans employed in the joint ventures? Second, the paper will assess the validity of the constructive engagement strategy. After more than a decade of intense commercial relations with the island nation through investment, tourism, and trade, has Canada succeeded in moving Cuba toward democratic governance, human rights, and economic freedom? To address questions regarding progress in Cuba’s political and economic climate, the discussion will rely in part on two well-recognized annually published indicators, the Index of Freedom in the World and the Index of Economic Freedom. This paper is divided into four sections. The first section highlights the decade-long Chrêtien policy toward the Castro regime. The second analyzes Canada’s comprehensive economic relations with Cuba during the special period. The third section examines the terms under which Canadian and other international investors operate in Cuba, with attention focused on the division of production gains between joint-venture employees and the regime. The fourth section presents an empirical assessment of the validity of Chrêtien’s Cuban policy of constructive engagement and dialogue. Along with Mexico, Canada was the only Western- Hemisphere country that did not break relations with Cuba in the early 1960s. Although Canada’s policy toward Cuba has waxed and waned with various governments, there has been a traditional tenet of Canadian diplomacy that international commerce should not necessarily be impeded by ideological differences (Kirk and McKenna 1997, p. 38). By 1981, with two-way trade at $474 million, Canada had become Cuba’s principal non-communist trading partner, outstripping Japan, France, and Spain. With the unraveling of the Soviet bloc, Canada’s business community envisioned new commercial opportunities in Cuba through trade and investment. By the time Mulroney left office in 1993, Canadians already constituted the largest number of tourists to Cuban beaches (about a quarter of the total). In the absence of a U.S. economic presence in Cuba, Canada held an enviable position among advanced market economies in the island economy. In October 1992, while Mulroney was still in office, the U.S. Congress passed the Cuban Democracy Act, more commonly known as the Torricelli Act. This legislation was designed to limit exports to Cuba from U.S. subsidiaries based in other countries, including Canada. Notwithstanding Mulroney’s close ties to Washington, he made it clear that Canadian companies, whether branch plants or subsidiaries of U.S. companies, were obliged to respect Canadian law. Accordingly, his government enacted legislation designed to neutralize the extraterritorial application of the Torricelli Law, thereby confirming Canada’s traditional tenet regarding international diplomacy and commerce. Riding into power in a landslide victory, Liberal Prime Minister Jean Chrêtien deepened the ties between Canada and Cuba far beyond under any previous government (Warren 2003, p. 1). Henceforth, constructive engagement and dialogue with the Cuban regime would, in his view, advance economic and political liberalization in Cuba (Campbell 1996, p. 497). In December 1994, at the Summit of the Americas in Miami, Chrêtien was openly critical of the U.S. position on Cuba. The best way to cultivate democracy in Cuba, he asserted, was through constructive engagement rather than isolation. His government’s position was repeated at the meeting of the General Assembly of the OAS held in Haiti, in June 1995, and Panama, in June 1996. Skillfully playing the French-Canadian card, Chrêtien emphasized the “Common Latin Blood” that bound Mexico and Canada, distinguishing them from their large mutual neighbor (Kirk and McKenna 1997, p. 151). As it evolved, Canada’s policy toward Cuba increasingly reflected Foreign Minister Lloyd Axworthy’s (1996– 2000) blue print which called for the rejection of the “camp follower approach to the United States” (Warren 2003, p. 5). Inspired by former Prime Minister Pierre Trudeau’s Third Option of the 1970s, Axworthy’s position, and the ideology behind it, were at the core of the Liberal government’s strategy toward Cuba and the Western Hemisphere (Warren 2003, p. 5). Although the United States and Canada have differed greatly in their approach to the Cuban regime, the Helms-Burton Act in the mid-1990s set the two North American neighbors on a collision course (Sagebien 1996). The Cuban Liberty and Solidarity Act, known as the Helms-Burton Law, was passed with an ample Congressional majority and signed by President William Clinton in March 1996. Helms- Burton was part of the U.S. response to Cuba’s harsh repression of an incipient organized peaceful opposition and the shootdown over international waters of two civilian unarmed Cessnas belonging to “Brothers to the Rescue,” a Miami-based organization. Title III of Helms-Burton gives U.S. citizens that hold valid claims a right of action in U.S. courts against those who knowingly “traffic” in their confiscated properties. Title IV of the law excludes the “traffickers” and their immediate families from entry into the United States. Sherritt International Inc., an Alberta-based company, became the centerpiece of the U.S.-Canadian controversy over application of Helms-Burton. A mining company, Sherritt, had entered into three 50–50 joint ventures with the Cuban government (Sagebien 1996, p. 162). These three Canadian-Cuban companies mine, refine, and market products extracted from the nickel mine and smelter at Moa Bay in Eastern Cuba. Originally built by a U.S.-based subsidiary, Freeport Sulphur Co., the Moa Bay property was confiscated by Cuba in 1960 just as they came on line. A self-described close friend of Fidel Castro, Sherritt Chairman Ian Delaney explained that “we do business all over the world, but there is no place we like better to negotiate deals than Havana” (Kirk and McKenna 1997, p. 163). Sherritt’s operations in Cuba came under sharp criticism in the United States in both liberal and conservative opinion journals (Lane 1996; Falcoff 1998). Canada’s activist Cuban policy began to unravel following the arrest and imprisonment of four Cuban dissidents. Failing to change the regime’s human rights conduct, Chrêtien in March 1999 ordered a review of relations with Cuba, ushering in a new phase in Canadian policy. In his four-hour Revolution Day nation-wide address on July 26, 1999, Fidel Castro referred to Canada as “enemy territory” (Warren 2003, p. 9). Significantly, Senior management of Canada’s Department of Foreign Affairs and International Trade were never enthusiastic about the Liberal government’s rapprochement with Cuba, and many other Canadian officials became ambivalent about the effectiveness of constructive engagement. Nevertheless, despite Chrêtien’s policy review, Canada’s relations with Cuba continued to be dominated by special interests—business, tourists, academics and NGOs—all of which favored engagement (Warren 2003, p. 10). Indeed, many of the NGO groups believe that the Cuban revolution has been a positive development for the island. As of 2003, Chrêtien’s last year in office, there existed no powerful lobby calling for an end to engagement. Following his 1999 review, the Prime Minister explained that Canada was still engaged in Cuba, but it was necessary “to put some northern ice in the middle of it” (Basdeo and Hesketh 2002, p. 42). While Canada was among the first countries to protest the Cuban regime’s massive crackdown on 75 political dissidents in April 2003, the response according to Christina Warren, “has been timid when compared to the Canadian government’s reaction to the jailing of four prominent dissidents in March 1999” (Warren 2003, pp. 7–8). Reflecting on the outcome of his successor’s Cuban policy, Brian Mulroney characterized constructive engagement as a failure of “soft diplomacy” (Basdeo and Hesketh 2002, p. 42). In their 1996 article entitled “Cuba libre: Blending tropical socialism with market economies,” John M. Kirk and Julia Sagebien (1996, p. 34) observed that “The moment you arrive in Cuba, you become aware of Canada’s role as a trade and investment partner in this Caribbean island.” They point out that the airport at Cuba’s main resort destination, Varadero, was built by a Quebec company; sophisticated landing equipment at Cuban airports and hotel reservations systems are supplied by Ontario-based companies; and that most of the sound equipment in Canada’s discotheques is from Canada. Unlike in many other countries in which Canada has a significant trade and investment presence, U.S. companies are conspicuously absent. Hence many Canadian, European, and Latin American firms have been taking advantage of the window of opportunity presented by the opening of the Cuban economy and the absence of a U.S. commercial presence. A growing number of foreign companies have invested in Cuba since the early 1990s, attracted by the opportunity to get a foothold in the Cuban economy before the lifting of the U.S. economic embargo. Canadians particularly have taken advantage of the proximity of their country to the island nation, and the complementary structure of the two economies. Leisure Canada, like other foreign tourism companies, has explicitly stated that it aims to meet anticipated demand from American visitors once the travel ban is lifted (Spadoni 2002, 169). Furthermore, some foreign investors are anticipating large capital gains from selling their Cuban holdings to American companies following resumption of economic relations between the United States and Cuba. Of the 540 joint ventures with foreign capital, 400 remained in operation in 2001 (Spadoni 2002, 184). Spain had the largest number of investors (97); Canada followed with 75; Italy was next with 55; and 18 enterprises had French investors. Of these 400 mixed entities, 83 were involved in basic industry, 75 were in tourism, and 40 were engaged in construction. Although Canadian firms ranked second in the number of joint ventures, they likely led the other country sources in the value of accumulated investment. CEPAL estimated the stock or accumulated value of foreign direct investment in Cuba at $2,118 million at the end of 2002. Canadian direct investment in Cuba has been estimated at 830 million Canadian dollars (equivalent to U.S. $600 million) at yearend 2003 (DFAIT, Canada-Cuba Relations 2005). 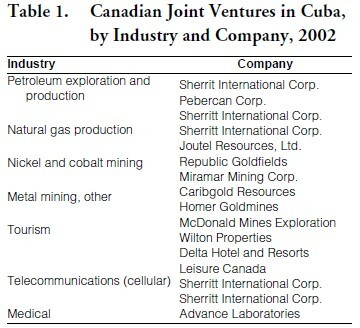 Table 1, shows the major Canadian joint venture partners in Cuba by industry and company representation. Canada’s Cuban holdings cover a broad range of activities, notably in energy development, mining and tourism. The most successful Canadian entrepreneur to take advantage of Cuba’s new foreign investment policy was Ian Delaney of Calgary—the first of a number of Canadians to pioneer the new Cuban business connection. In 1991, searching for nickel to feed his refineries at Fort Saskatchevan, Alberta, Delaney made a deal with Fidel Castro that initiated a spate of joint ventures with the Cuban government (Koth 2002, p. 119). Today, his Sherritt International Corporation is the premier Canadian investor in Cuba. The company holds a business portfolio (Table 1) in key areas of the Cuban economy: nickel and cobalt mining, oil and gas exploration and development, power generation, telecommunications, tourism, and agriculture (Sherritt International Corp Annual Report 2000). Commencing operations in 1992, Sherritt is the largest foreign oil producer in Cuba. At yearend 2000, Sheritt’s total assets reached 524 million Canadian dollars ($U.S. 350 million) of which 354 million (68 percent) were held in Cuba. After 2000 the company’s financial position and earnings continued to improve strongly. Total assets in U.S. dollars exceeded $2.1 billion at the end of 2004; during that year the company’s sales reached $905 million on which it earned in excess of $133 million or nearly 15 percent (Linger 2005, p. 9). Cuba’s state mining agency, Geominera, has entered into joint venture agreements with a number of Canadian companies. These include Joutel Resources, Ltd., Republic Goldfields, Miramar Mining Corporation, Caribgold Resources, Homer Goldmines, and Macdonald Mines Exploration (Table 1). Canadian hotel chains are a major feature in Cuba’s burgeoning tourism industry. Leading Canadian travel companies (see Table 1) operate in joint ventures with the Cuban government or through management contracts, both of which provide the Cuban partners with improved quality control and foreign market access. Although gross tourism income has become the island’s most important source of hard currency, Cuban tourism is burdened with a huge import requirement as well a the foreign exchange cost of profit remittances, royalties, and management fees. Cuba’s overseas trade has been characterized by a persistent and widening merchandise trade deficit. As an example, Cuba’s imports of $4.2 billion in 2002 dwarfed its exports of just under $1.3 billion. Canadian- Cuban trade, by contrast, shows only a small Cuban deficit when the longer period 1989–2003 is considered. Two-way trade between Canada and Cuba grew from $194 million in 1990 to $497 million in 1997 before declining to $444 million in 2003 (IMF 1995 and 2004). From 1997 to 2001 Canada ranked second only to Russia as Cuba’s most important export market. During this five-year period Canada ranked fourth among Cuba’s importing partners behind, in descending order of importance, Spain, Venezuela, and China (calculated from Pérez- López 2003, p. 7). Surpassing Spain, Venezuela became Cuba’s top source of merchandise imports in 2001 and continued to hold this place in the next two years by virtue of its position as main supplier of Cuba’s oil imports. The commodity composition of trade and reflects the complementary resource structure of the two countries (CIA 1998). Canada’s exports to Cuba are heavily weighted toward food (mainly temperatezone agricultural products) and manufactures (machinery, semi-finished goods, and transport equipment). Nickel and sugar dominate Cuba’s exports to Canada, with fish and tobacco assuming minor importance. Cuba’s nickel exports to its North American partner—non-existent in 1990—have emerged as Canada’s leading import commodity. Tourism has become the island’s most important hard currency earner, surpassing sugar, nickel, and tobacco exports. The number of foreign visitors to Cuba increased from 326,000 in 1989 to 1,686,000 in 2002; gross income from tourism during these years rose from $204 million to just under $1.8 billion, a nine-fold increase. 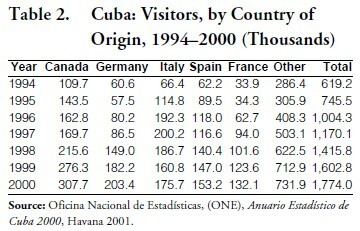 Table 2 compares visitors to Cuba by country of origin from 1994 to 2000. Canadian tourists and business travelers year after year have exceeded visitors to the island from Spain, Germany, Italy, and France, Cuba’s other leading tourism markets. Cuba has emerged as the fifth most popular foreign destination for Canadians (after the United States, Mexico, United Kingdom, and France). In 2003, an estimated 494,000 Canadians visited Cuba (DFAIT, Fact Sheet Cuba). Unlike Japan and several West European countries, Canada has been a marginal lender to Cuba. Of Cuba’s hard currency debt of $13.3 billion at year end 2004, Canada’s share was a mere $90 million which placed it at 16th, just above Austria, among Cuba’s creditor countries (Cuba Facts, February 2005). The Canadian International Development Agency (CIDA) has been a key component of Canada’s longstanding policy of engagement in Cuba. The agency supports development partnerships between Canadians and Cubans through university exchange programs, NGO projects and youth internships. As a leading donor in Cuba, CIDA has supported requests for support with more than $10 million in assistance annually over the last several years. Clearly, Canada’s economic engagement with Cuba has been significant and comprehensive. 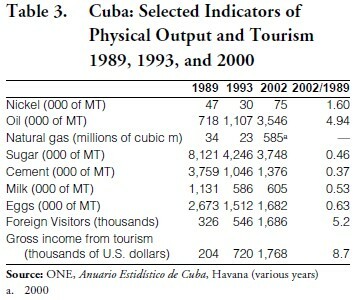 Cuba’s partial economic recovery from the collapse of 1993 is closely associated with Canadian direct investments and Canadian tourist outlays in the island. Table 3 gives selected economic indicators for the years 1989, 1993, and 2002. A comparison of nickel, oil and natural gas output between 1989 and 2002 shows strong expansion, especially oil and natural gas. Also, notable gains are shown for tourism, both the number of visitors and gross tourism income. Between 1989 and 2002 arrivals increased by a factor exceeding five and dollar tourism income expanded nearly nine-fold. By contrast, milk and egg production (indicators of domestic living standards) shrank appreciably between 1989 and 2002; cement production (related to domestic construction activity) fell nearly 60 percent during the same period. Canadian investment and technical assistance in Cuba’s nickel mines were instrumental in the revival of Cuba’s obsolescent nickel industry. Nickel output rose from 30,000 MT in 1993 to 75,000 MT in 2002. By 2000 the value of nickel exports exceeded the value of Cuban sugar exports (which reflected an output collapse exceeding 50 percent in 2002 compared with 1989.) Two Canadian oil companies accounted for an estimated 68 percent of Cuba’s petroleum output (Roque 2002) and a substantial share of this crude production was refined by Canadian firms. The island’s spectacular increase in natural gas production is largely attributed to Canadian investment and technology. Sherritt, together with Montrealbased Pebercan have discovered a new field with 100 million barrels of oil reserves. Announced in December 2004, this recent off-shore discovery could cover Cuba’s domestic needs for an estimated three to four years (Energy Intelligence Group, Inc., January 13, 2005). Canadian investment in Cuban oil production and refining, as well as in natural gas production, has reduced Cuba’s dependency on energy imports with massive foreign exchange saving. • Ordinary Cuban citizens do not enjoy property rights: They may not own or accumulate capital assets, engage in foreign trade or participate in joint ventures with foreigners. • University graduates are prohibited from practicing their professions as self-employed persons. Physicians, dentists, lawyers, accountants, engineers, architects, among others, may not offer their services in their private capacity. • Foreign investors are generally required to enter into joint ventures with state-owned entities in which the latter hold at least 51 percent of the mixed enterprise’s stock. • Following Cuba’s economic crisis of early 1990s the socialist economy has been substantially militarized: high-ranking officers of the Fuerzas Armadas Revolucionarias (Revolutionary Armed Forces-FAR) have been given direct control of major segments of the state-owned economy (Amuchástegui 2000; Mastrapa 2000). These include sugar production, mining and oil exploration, foreign trade, transport, communications, the merchant marine and ports, fisheries and the resurgent and lucrative tourist industry. • Foreign investors are attracted to Cuba by a tax regime that permits duty-free imports of equipment and raw materials, free remittance of profits and no capital gains taxes on the liquidation of the investment. Foreign executives operating in Cuba are exempt from taxation of their income. Specifically, the foreign enterprise partner is required to pay 30 percent on net profits and a 25 percent payroll tax to cover employment benefits provided by the government. • Foreign companies are not permitted to hire workers directly. Instead they must contract with a state agency, such as Cubalse or Acorec, which—in the absence of independent unions—guarantees a docile and disciplined labor force. Foreign companies can and do fire any employee without justification. The foreign partner in the joint venture must pay the wages of its employees in U.S. dollars to the hiring agency, which then pays the employees in pesos at the official $1.00 = 1 peso exchange rate. As an example, the average dollar wage in joint ventures was $450 per month in 2001 on which the 25 percent payroll tax was applied (Travieso-Díaz and Trumbull 2002). However, because the effective exchange rate in 2001 was 26 pesos per dollar, the employee received less than five percent (expressed in real purchasing power) of the $450 monthly paid to the employment agency. Put another way, the state through its onerous exchange tax drives a huge wedge between the per worker labor cost to the foreign company and the employee’s effective wage. Defacto wage confiscation has become the government’s most important source of revenue from joint-venture operations. • Joint-venture employees must belong to a single labor confederation, Central de Trabajadores de Cuba (CTC). Controlled by the state, the CTC is directed by a member of the Cuban Communist Party’s elite political bureau (Sibley 2001, p. 6). The CTC does not promote worker rights or labor law, and it does not protect the right to strike. In brief, the system is structured so that the state dominates every phase of the labormanagement relationship. Labor rights, notes Maria Werlau, have been absent since Fidel Castro’s rise to power. Upon his victory in 1959 Cuba’s independent labor unions were intervened and “many of its leaders arrested, executed or exiled” (Werlau 1996, p. 478). Belatedly the Europeans began to have misgivings about these terms of engagement and expressed them to the Cuban government. Marta Lomas, Minister of Foreign Investment and Economic Cooperation, responded in 2002 that Cuba will not change these rules and the “European businessmen knew these rules when they arrived” (cited in Castañeda 2003, p. 139). Similarly, Canadian businessmen and government officials knew these terms when they arrived. Commenting on the Cuban situation, Madrid correspondent Rafael Rubio stated: “Given all this, it is difficult to escape the conclusion that foreign firms in Cuba are investing not in a country that happens to be a dictatorship, but in the dictatorship itself. They are forced to invest in the Castro regime, reinforcing its capacity to repress the Cuban people” (Rubio 2005). “Induced” rather than “forced” would better characterize the firm’s motivation. In a prescient 1996 article, Maria Werlau explored the reform-generating capabilities of foreign investment as an instrument of commercial engagement. She observed that Cuba’s joint venture framework has been designed to secure regime survival while suppressing the impact of socio-economic and political reform. “Ultimately”, she concluded, “neither pressure nor constructive engagement may be capable of bring about the desired democratization and economic freedom of Cuba; these remain primarily dependent on internal circumstances” (Werlau 1996, p. 485). While some authoritarian regimes survive by fostering widespread economic growth—most recently China and Vietnam come to mind—the post-Soviet era Cuban regime has survived by restricting access to capitalist rewards. In retrospect, Fidel Castro’s economic strategy since the mid-1990s may be described as an internal blockade designed to abort the emergence of a private entrepreneurial class. In his article “The Gatekeeper State,” Javier Corrales defines Cuba as a “small-winning-coalition regime” whose pillar includes three selective groups: the monolithic party (with a membership in 1997 of 780,000 in a country of 11.4 million), the military (with 50,000 troops in 1999), and the security apparatus, whose size is unknown. He argues convincingly that as long as “enough things of value” can be provided to these actors, which is not too costly because of their small numbers, “their loyalty can be preserved even during harsh times” (Corrales 2004, p. 27). To test Prime Minister Chrêtien’s policy of constructive engagement and dialogue, we use two well-recognized, annually-published indicators: The Index of Economic Freedom and the Index of Freedom in the World. To supplement these quantitative measures, we present anecdotal evidence that sheds light on episodes of liberalization or repression. The Index of Economic Freedom is compiled jointly by the Heritage Foundation and the Wall Street Journal. It covers 158 sovereign nations and among the criteria used to classify economies are property rights, regulation, trade policy, black market, fiscal burden, and monetary policy. The index classifies countries as “Free,” “Mostly Free,” “Mostly Unfree,” and “Repressed.” Between 1995 and 2003, the Cuban economy has been consistently classified as “Repressed” and in 2003 it was ranked near the bottom at 153, just above North Korea. As part of a general retreat from its timid economic opening, the Cuban government in 2003 stripped state enterprises and joint ventures of their former quasi-autonomy. Before this economic recentralization some 350 enterprises were permitted to compete, make day-to-day decisions, seek credit, and engage in foreign trade operations. Since 2003, however, Cuba’s central bank must approve any sizeable hard-currency transaction and the Foreign Trade Ministry has reasserted control over enterprise exports and imports (Economist, July 3, 2004, p. 33). In September 1992, as part of its economic liberalization program, the Cuban government authorized self-employment in more than 100 occupations, primarily those related to transportation, crafts, home repairs, and personal services. Shortly after this authorization, there was an explosion of home-based restaurants, commonly called paladares. From its inception, self-employment has been bound by severe official constraints: in addition to paying heavy taxes and fees, the self-employed may not hire others; and the paladares are restricted to twelve seating places. After peaking at 209,600 in January 1996, and now including 140 occupations, the number of self-employed began inexorably to decline (Pérez-López 2002, pp. 170–71). Facing new taxes and fees, selfemployment fell to about 160,000 in 1998. Under a Labor Ministry decree effective October 2004, no new licenses will be issued for forty categories of selfemployed that had been legalized in 1993 (Wall Street Journal, May 6, 2004, p. A16). The roughly 150,000 self-employed Cubans in early 2004 represented only 2.1 percent of the country’s work force. From 209, 600 in 1996 to the 150,000 that remained in 2004, licensed self-employment shrank by 59,600 or 34 percent—a dismal commentary on Cuban economic freedom. Freedom House of New York has for 30 years conducted annual assessments of political freedom and human rights. The list now includes 192 countries. Each country is assigned a status of “Free,” “Partly Free,” or “Not Free,” and is given a score that averages its political and civil liberties ratings. Those countries whose ratings average 1–2.5 are considered “Free”; at the other extreme, those averaging 5–5.7 are “Not Free.” Significantly, from 1990 to 2003 Cuba has been consistently ranked at 7. In 2003 Cuba was included among the eight worst countries for both political rights and civil liberties along with North Korea, Sudan, Iraq, and Burma. After a short-lived liberalization episode, the Cuban regime in 1996, 1999, and again in 2003 unleashed waves of repression against human rights and pro-democracy leaders. The high-water mark for human rights groups, according to Jorge Domínguez, was reached in the mid-1990s (Domínguez 2002, p. 266). In October 1995 an organization called the Concilio Cubano (Cuban Council) was founded to represent 108 dissident factions. The umbrella organization petitioned the government to meet in Havana between February 24 and 27, 1996. The government’s response was to ban the assembly and to imprison the Concilio leaders and some of its followers as well. After the 1996 repression several of the Concilio’s leaders went into exile. In April 2001 the United Nations Commission on Human Rights voted to condemn Cuban human rights practices. A year later, Uruguay became the first Latin American country to sponsor a similar resolution in the Human Rights Commission to condemn the Castro regime’s treatment of dissidents and political prisoners. In a massive crackdown on peaceful Cuban political dissidents, the Cuban regime in April 2003 summarily tried and imprisoned seventyfive Cuban citizens, their terms averaging nineteen years (Bond 2003). Independent journalists, academics, librarians and democracy activists comprised the majority of the imprisoned. A few days later, three men who had hijacked the Havana Bay ferry were given a one-day trial and executed by firing squad, despite the fact there had been no violence during their botched crime. According to the most respected international human rights organizations—Amnesty International, Human Rights Watch, and Pax Christi—the Cuban situation “had dramatically worsened in 2003” (Castañeda 2003, p. 15). As Theresa Bond observed in the conclusion of her article on the brutal 2003 crackdown, the successive waves of emigration during the forty-four years of Castro’s rule, created a huge Cuban diaspora, totaling one-tenth of the island’s eleven million population (Bond 2003, p. 130). In a sharp departure from his Conservative predecessor, Prime Minister Jean Chrêtien (1993–2003) deepened the political and economic ties between Canada and Cuba far beyond any previous government. For Cuba, according to Basdeo and Heskett, Canada represented an “economic lifeline at a time of considerable economic and financial need” (Basdeo and Heskett 2002, p. 44). Canadians, the largest national grouping to visit the island nation annually, contributed substantially to the success of Cuba’s burgeoning tourism industry. Canadian investments across a spectrum of Cuban industries were instrumental in the partial recovery of the economy following the 1993 collapse. Unlike Japan and several West European countries, Canada has been a minor lender to Cuba. On the other hand, as a leading donor, the Canadian government has supported development partnerships between Canadians and Cubans and has responded generously to the damage and hardships caused by recent hurricanes in the island. Contrary to Chrêtien’s expectations, Canada’s policy of dialogue and constructive engagement failed to overcome President Fidel Castro’s intransigence with respect to democratic governance, human rights, and economic freedom. The high-water mark for human rights groups was reached in the mid-1990s. This was followed in 1996 by the repression of the Concilio Cubano, its leaders and members, and in 2003 by the most severe crackdown against peaceful dissidents in the Marxist-Leninist state. The Index of Economic Freedom has consistently classified the Cuban economy as repressed and in 2003 it ranked Cuba at 153, just above North Korea. The Index of Freedom in the World has annually given Cuba the lowest rating for both political rights and civil liberties. Among the eight countries classified in 2003 as the least free, the index placed Cuba under Burma and just above North Korea. New York Times columnist Nicholas Kristoff recently observed that in countries such as Taiwan, the Republic of Korea, and Spain, “dictatorships crumble because growing wealth nurtured a middle class, not because of sanctions” (Kristoff 2003). We agree. Their former authoritarian governments permitted the enlargement of economic freedom. In Cuba, by contrast, the system is programmed to forestall the emergence of an entrepreneurial middle class. Unlike China and Vietnam, the Castro leadership survives as a “small-winning-coalition regime” through concentrated rewards targeted to the elite Cuban Communist Party, the military and the security apparatus in exchange for their loyal support. The “rules of engagement” under which Canadian and other foreign investors participate in Cuba appear to be heavily biased against their Cuban employees while empowering the ruling elite. If Cuba has a fundamental change in government and revival of independent labor unions, could the foreign companies be held legally responsible for their complicity in these biased arrangements? Canada and the European Union (which in economic matters is presumed to speak with a single voice) missed the opportunity jointly to use their initial bargaining power with the regime to secure economic rights for Cuban citizens. 1. The authors wish to thank Dr. Julia Sagebien, Dalhousie University, for her helpful commentary on this paper and for providing us with up-to-date information on Canada’s relations with Cuba. The findings, interpretations, and conclusions expressed in this paper are those of the authors.